Add a little mystery to your outfit with this beautiful eyemask. Great for aristocratic balls and masquerade parties. Princess mask,make you be the focus,pretty look,fine quality. Size:6.4*4.1IN,one size fit most people. Color:including 6pcs,Red,Blue,Light Blue,Beige White,Black,Pink.Choose the color you want, add a little mystery to your outfit. 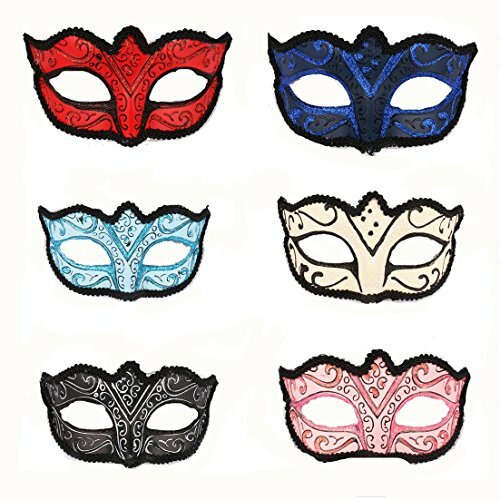 Lovely and elegant masks: come in multi color, easy to keep on faces, give people mysterious, elegant and sleek feeling, make you more attractive on party. Hand Painted, venice style, using the high quality Resin, Silk and other eco-friendly materials; Comfortable, lightweight, universal-fitting. No flaking of paint, no messy excess glue residue, and no discoloration. These masks are a favourite of many photographers and stylists alike for their elegant and mysterious properties! Popular for themed parties. Ideal for any Special Occasion: Masquerade Balls, New Year's Eve Party, Christmas Party, Proms, Weddings, Halloween Parties, A Gift for your Wife or Girlfriend on Valentine's Day . THEY ARE ALSO GREAT FOR HOME WALL DÉCOR.